I do agree with Alex, Mateo, and dankcalculatorbro that it is not (yet) a big issue. Whoa whoa whoa. It's an incredibly big issue. If it's not a big issue now, then when will it be a big issue? Apparently these changes go into affect in 60 days (now something like 58 days) and there are forms of activism around getting Congress, and the House, to prevent the repeal of Net Neutrality. So please, contact your representatives. Remember when I said local elections matter? This is why. As I understand it, a form of Net Neutrality has been around since the FCC was founded in 1934. There are two 'titles' that back up what they can do though. Title 1 which enforced their rules on telecommunication services, like the telegraph and telephone, Title 2 (introduced in 2015) expanded those rules to broadband and cable services (ISPs). And it was introduced in "Communications Act of 1934." So, Title II was not introduced in 2015, ISPs were merely labeled as a "Common Carrier" in 2015. Much like our Water, Natural Gas, and Electricity suppliers are all classified under Title II. For the water companies, this means they can't prioritize the supply of water to certain establishments. Such as - as a bad example - water pressure. Everyone is entitled to the same water pressure today but let's enter a universe where water companies are not classified as Title II. Perhaps you're member of a gym and you pay $80 a month. The water company sees that this is a really awesome business to be in because it's incredibly profitable. So they start creating their own gyms but no one is signing up. So, the water company ups the water pressure to their showers and advertise that they have superior water pressure. Perhaps something like "Shower twice as fast with twice the water pressure!" The gyms want to be competitive so the water company charges a fee for additional water pressure. Gyms could raise membership costs so they can cover the "increased water pressure" fee in order to compete. So now you're paying $100 a month for the gym. But, you can now sign up for this water company gym that's only $80. Now, instead of water imagine the internet. A major ISP wants to compete with Netflix. So they create their own service and prioritize "ISP-flix" traffic with faster bandwidth. Instead of your "20Mbps" service, you can get "ISP-flix" for 200Mbps. If Netflix wants to be competitive, they have to fork over money to the ISP so they can get the same speed. In order for Netflix to maintain that fee to the ISP, and be able to pay for content licenses, original shows, and it's employees, they need to raise the cost of their monthly subscription. So, instead of $15 a month for Netflix, you're now paying $20. Meanwhile, "ISP-Flix" is only $15. Remember, there's more than one ISP, so Netflix could be completing with multiple "ISP-Flix's" and thus, paying fees to multiple ISPs to ensure they are competitive. You may be paying for 20Mbps but Netflix and "ISP-Flix" can stream in at 200Mbps. This also snuffs out smaller competition. Today, there's nothing stopping someone from creating a Netflix competitor. As both services are given equal priority. But with the repeal of Net Neutrality, Netflix can afford to pay for prioritization while the smaller competition can't. So, Netflix may be able to stream at 200Mbps while the smaller guys can only send data to your residence at your 20Mbps rate. So, now the IPSs are getting paid by content providers to send information on top of the money the ISPs receive from individuals to receive that content. While preventing competition from sprouting. It's dangerous all around. Another reminder to contact your representatives. What do people think about this article? I think it will be a big issue if the ISPs use it to create the “fast lanes” for certain content, and things like that. If things like that don’t happen, then I suppose we are just as we were before, minus a law that makes us more vulnerable to these things. As some of you know, the vote for congress to stop the repeal of Net Neutrality is coming up. As in, THIS WEDNESDAY! We still only need 1 more senator to vote for net neutrality, but without that one person, the repeal of Net Neutrality will pass! We have less than 7 days to get one more vote! If it passes, it will move on to the house for another voting. Don't let that happen, we only need one more vote in this session, if it passes we'll have to convince dozens of people in the next vote! This is our best chance to stop the ridiculous repeal of Net Neutrality. Find a senator in your state that doesn't have a stance and write or call them! The easiest place to do this is at https://www.battleforthenet.com/. I did this and was done in less than 10 minutes. Don't have that time? If it's something on the internet that's preventing you from writing or calling, I think you can take a pause just long enough to write a letter. Not in the US? You can still do something. You may have seen my or jcgter777's signature change, this is what you can do. You can post the 'Red alert' user bar into your signature. There are lots of options here. You can even copy and paste the link from my signature, I don't care. Remember, there are less than 7 days left. Do something before it's too late. 24 hour notice! Act now! If PT_, who doesn't even live in the USA, can do it 2:48AM, there's no excuse why you can't do it now. Ok, well he didn't actually call a senator, but you can still follow what he said. Hey! We won! The senate voted to save Net Neutrality! The fight isn't quite over, in a little less than a month, the vote will have to go through the House of Representatives, however it's very likely that we'll see the same outcome as we did in the senate. Thank you to everyone who changed their signature or avatar to spread the word! I'm sure there were many more, I'll edit this as I remember them. This is one small step for [the] senate, one giant leap for internetkind. Don't forget to thank any of your representatives that voted to keep/restore Net Neutrality! We were so loud and persistent, bugging them on voting to keep NN that it'd only be right to express our gratitude to thank them for listening to their constituents. Even if your representatives voted no, contact them and tell them how disappointed you are. The fights not over even if it passes in the House. It's still gotta be signed into law by the President. If he doesn't sign it, the bill can still become law but there needs to be greater approval margins in Congress for that to happen. YESS!!!! I'm glad they did the right thing for the internet. I'm going to keep my avatar until the president signs this into law. That sounds harder. Wasn't Trump against net neutrality? And even the recent votes in Congress, IIRC, have far too evenly divided for comfort. It's incredibly hard. If voting continues the way it has on this issue, it won't pass. And let's be realistic. The House of Reps is made of 435 voting members, 235 of which are Republicans, 193 are Democrats, and the remains 7 are vacant/non-voting. In order for a bill to pass the house, it needs 218 votes. But, what this does is forces the issue before most of the midterm elections in June. So, watch who votes (and has voted) No on this bill. When it comes time to vote in your state (and provided you are eligible to vote), vote them out of office. 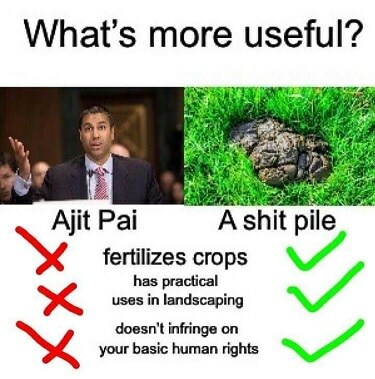 Vote for someone who campaigned to keep Net Neutrality. Let's say, for the sake of argument, it passes the House. The bill is now presented to Trump to sign into law and he has 10 days to veto it before it automatically becomes law without his signature. If the president says "No" (aka a Veto) to the bill, it's given back to Congress and both the House and the Senate have to vote 2/3rd in favor to override the Presidential veto. Which, with as slim as the margins were in the Senate, isn't likely. Has this happened before? Yup, as recently as 2016 when Congress overrode Obama's veto on allowing US families to sue Saudi Arabia but that's because Congress was largely Republican, all of whom supported the bill. It's not the same with Net Neutrality, as Republicans still hold the majority in both chambers and they are largely against keeping and protecting NN. Again, this forces the issue of Net Neutrality onto politicians. If they vote no, then vote them out with someone who supports NN. 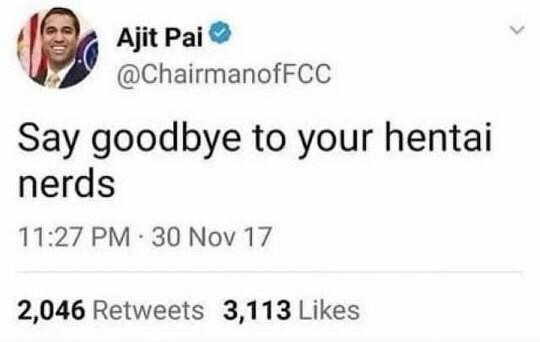 Hey, sorry for the short notice but the FCC repeal of net neutrality went into effect today. This does not mean the fight is over! We still have a little bit of time to convince the house to reverse the decision. Please, contact your representative! Oh crap. I thought we were winning. © Copyright 2000-2019 Cemetech & Christopher Mitchell :: Page Execution Time: 0.401546 seconds.